Wim Moerdijk is general director and shareholder of Monie. When you say"Wim", you say "First Class Quality Onions!" He started the company Monie with his father Marinus Moerdijk in 1983. The roots of the company lie more than 50 years back. In 1951 Marinus and Lijn Moerdijk started a company in agricultural business. Wim is present everywhere and regulates sales and all kinds of general and specific businesses. Eric is the youngest son of Wim Moerdijk. Since 2004, he works full time at the company. Eric participates as executive board member in the company via his own holding, since 2008. Eric is a very skilled forklift driver and responsible for bringing in the First Class Quality Onions, as well as assisting the pre-pack installation. He also gives assistance to other forklift drivers in the processing system. Rinus is the man of the road. He has been around since the fouding of the companyand already transported thousands and thousands tonnes of First Class Quality Onions from the growers to our company. His truck always looks tip-top! Jan Houterman has been working parttime at Monie for many years. He is a skilled quality inspector, as well as tractor driver who brings in the First Class Quality Onions from the farmers. Ko is "Technical manager" at Monie for many years. He is responsible for maintenance of the machines and buildings were the First Class Quality Onions are stored, sorted and packed. When he's around, be alert because he's always up for a joke! 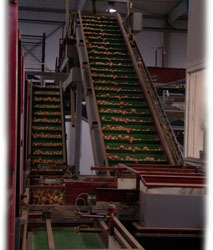 Kees has been in service since 1988 and is responsible for administration, accountancy and shipment of First Class Quality Onions. Peter works at Monie since 1989 and is a skilled quality inspector. His years of experience contribute to guarantee a top-class product. Rudi is a member of the Monie-team since 1993. You can find him at the onion-topper machine every day. Rudy is responsible for the first quality control of the First Class Quality Onions. 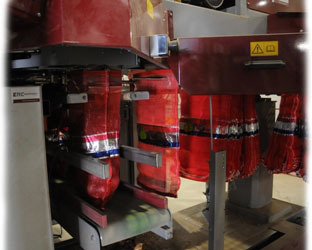 Rotten bulbs, rubbish and clots are removed here to obtain a clean product, wich can be dried very rapidly. With his friend and colleague Marc, he makes sure that the leaf remains are cut off very properly. Kees is agronomist for Monie, since 1995. His focus is to get a First Class Quality Onion. The basis of a final excellent product is a cultivation under optimal conditions. Of course, we are aware that the product is "pure nature". But, the parameters tot get a Monie First Class Quality Onion can be set to an optimum. Monitoring, experimental settings and effective use of Integrated Pest Management (IPM) and a Good Agricultural Practice (GAP) are key instruments. Martin works since 1998 at Monie. He is foreman at the sorting and packaging installation. 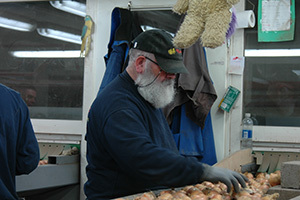 He is responsible for the correct sortings and the final First Class Quality Onions. The last person who sees the product before it is packed. Allal works since 1998 at Monie. You can find him every day on his own workplace. 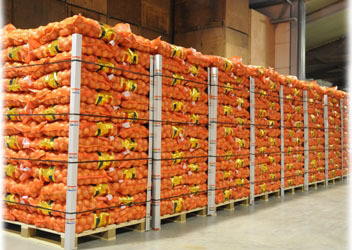 Allal is a key member for obtaining a First Class Quality Onion. Peter is an employee of Monie since 2001 and you can often find him in and around the room where the quality control of the onions takes place. He also knows a lot about packaging of and he can replaced Wilco Pieterse (the packaging-operator), if nessecary. Stefan is active in quality selection of a First Class Quality Onion. He's also very skilled in imitating all of employees. Moreover he's football freak. On monday morning, we can judge by his face if Ajax has won or lost last sunday. Since 2007, Jan-Jaap is the man who keeps things going. He fills the enloading bodies with First Class Quality Onions and takes the palletised bags from the palletising machine. This means that he has to deal with a lot of pressure. But Jan-Jaap is a driver with many expierence and he keeps a cool head! Wilco works since 2007 at Monie and is the man behind the packing machines. He keeps the output of the product going without a problem. Gerrit is working since 2008 at Monie. Together with his father Ko, he is responsible for the maintenance and repair of the machines and buildings. He also can replace Jan-Jaap as a forklift driver when nessicary. 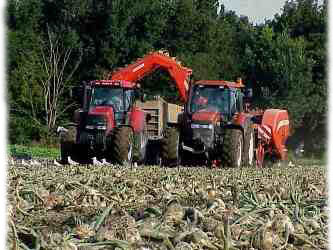 In the harvest period, Gerrit drives the tractor, to bring the First Class Quality Onions to our company. Dave works at Monie since 2008. He takes careof the pre-pack installation and knows everything about nets, bags and labels. He also helps Ko and Gerrit with maintenance work. You can find Jan every day on his own spot at the moving band conveyor. Always calm, to deliver a First Class Quality Onion. Jan keeps his head cool, and his feet warm, anytime. Marc - nicknamed "Henk" - is a jack of all trades. Onion topping, forklift or tractor driving, Marc will do everything. With a very rapid motion of hand and eye, no onion can escape his observation. 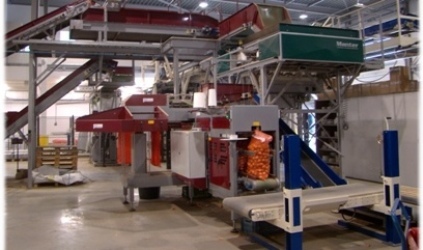 Theun is a very strong power if you're talking about quality control of onions at the sorting and packing compartiment, and at the onion topper machine as well. André is in the Monie-team since 2011. He is a solid quality inspector and assisting Jan-Jaap when needed. He is always there and remains calm at any circumstance. Bram is in the Monie-team since 2012 and is most of the time concerned with the quality control of the onions. Always in a good mood, he cheers everyone up by whistling or singing, or one of his extensive stories. Peter is truckdriver at Monie since 2012, but he is a real all-rounder. Whatever it is, he likes it and he does it very well and quick. Kees Bakker is in our team since 2012. Kees is on the road all day to find the best onions in the country and to buy them as well. Thanks to the great community of growers he knows, Monie can have good quality onions any time of the year. Lennart has been with Monie since 2014, after his one year internship. Lennart can be of help in any place and doesn't need a lot of words to do a lot of work. Since 2009, Miranda has had a summer job at Monie. After she finished school, she started full-time at Monie. Together with Dave and Peter Bastiaanse, she works mostly at the pre-pack installation.